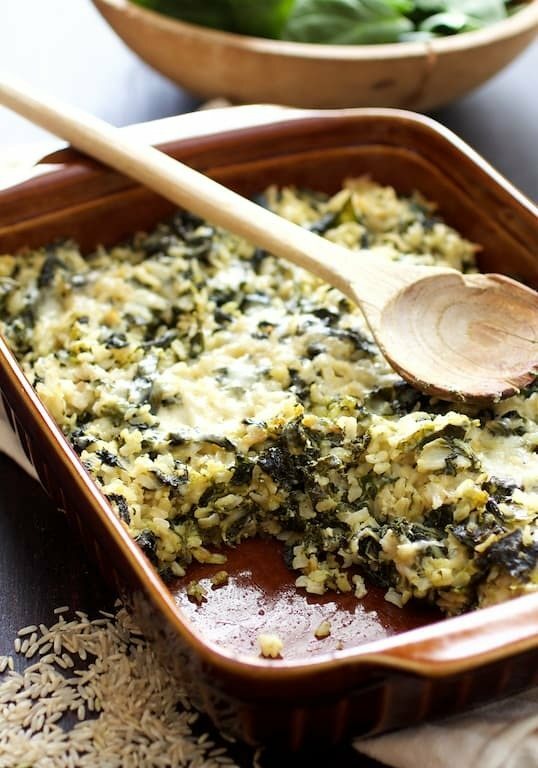 Grains and Greens Casserole is very flexible! Vary the grains and vary the greens! Preheat oven to 375 degrees. Oil a 13 x 9-inch baking pan. Heat olive oil over medium-high heat in a large skillet or saute pan. Add onion and cook until softened, approximately 5 to 7 minutes. Add the bok choy and kale in batches; cook each batch until wilted. Stir in garlic. Transfer to a large bowl. Add spinach to wilt slightly. Stir in cooked brown rice. Season to taste with salt and black pepper. Stir in eggs and cheese. Transfer to prepared baking pan. Cover with aluminum foil. Bake 35 to 40 minutes. Remove foil and continue baking until cheese and top is lightly browned.